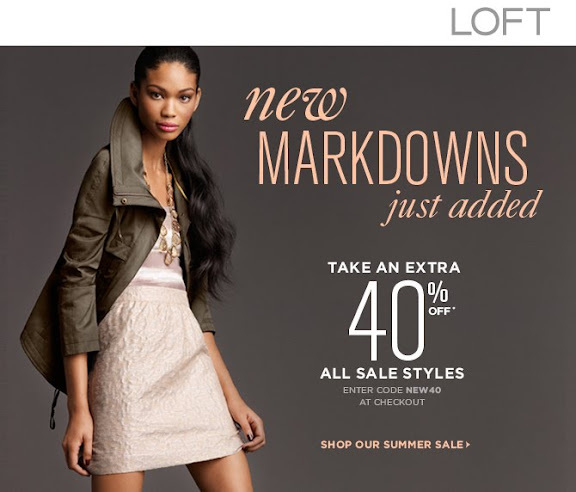 This morning I got an email from Ann Taylor LOFT. They are offering 40% off their sale selection (in store + online). I love when they do this! Make sure to enter coupon code | NEW40 at checkout to receive your 40% discount. What do you think of the picks? Any you are dying to take home? I really like that jacquard skirt! Just curious...It look like it's just online but do you know if it is also in stores? It doesn't say. I wish I knew! Does anybody else know the answer? Just found the answer in the fine print. It's in store and online! hooray. Really love the denim blazer and that v-neck cardigan (especially for that price!). Thanks for the tip! Thanks for posting - I just bought the yellow cardigan and the white button down! I really like the tiered tee, but what to wear it with for fall? @Tamara- I think these tiered shirts layer really well. With an open cardigan or blazer, this shirt could be a part of your wardrobe year round! Gorgeous. I love the shirt in the #2 slot. But no more shopping for me for a while! Oh this is tempting. . .
p.s. I added your blog to my blogscroll. Just thought I'd let you know! Oh wow! that jacquard skirt is adorable. I need it now. the skirt is even cuter in person--mine just came in the mail yesterday. :) and what a steal!